Everyone has “things” that they’re known for. Some good, some bad. 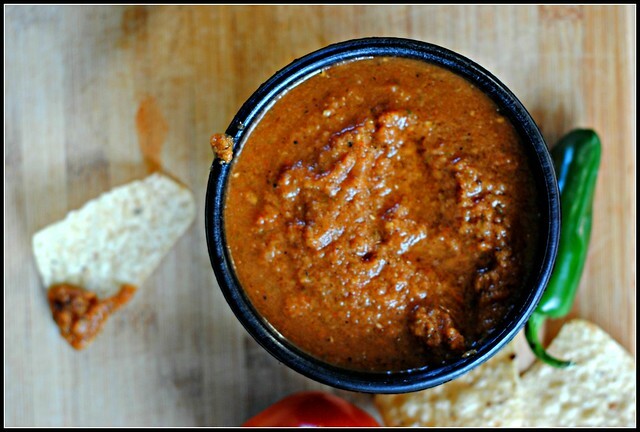 From the first time I made this Baja Fresh Grilled Salsa about 2 years ago, I’ve been “known” for salsa. Of course I have Biz to thank for this amazing recipe, and if there’s one thing that woman can do right…it’s salsa. If you recall, she was also behind the absolutely delicious Grilled Cherry Salsa. My mom makes this salsa…a lot. Mr. Prevention SEES tomatoes laying around and asks oh-so-kindly if I can make salsa. He adores this stuff. I would take this salsa to work back in Columbus and my coworkers ran out of tortilla chips before they came up for air. You’ve been warned! 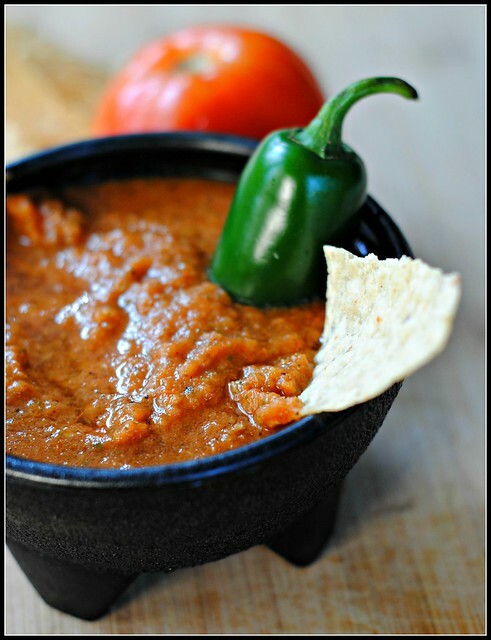 I’m very much so “known” for making salsa…and you could be, too! It’s certainly the time of year for tomatoes…and every other ingredient, come to think of it. I am also “known” for some bad things. Like speeding while driving, being disorganized, HATING to clean (the kitchen is the only exception), humanizing my dog, and being extremely gullible, to name a few. If you would ask my old hockey team, they would also tell you I’m “known” for almost scoring goals…but never actually making the puck INTO the net. Two years of hockey and not one goal while playing ice-hockey once a week every week while living in Columbus. I mean, seriously…TWO YEARS? I played hockey with a new team last night — an all women’s team for the first time since college. We played a team of guys and…I scored! It was pretty cool. As I was walking into the locker room last night, I was handed a beer (a Molson – the same beer my old hockey team drank nearly exclusively…it was a sign!) from the coaches. It was quite the warm welcome to hockey in the area and what a killer workout. I haven’t sweat that much on the ice in a long time. Pre-heat grill to medium heat. Coat tomatoes, jalapenos, onion, and garlic in olive oil. Grill vegetables until they are charred, but not falling apart. Place all ingredients (including cilantro, salt, and lime juice) in a blender and blend until smooth-ish. Serve with your favorite tortilla chip. Result: Classic but always a hit. This could not be easier to make and people go crazy for it. I think the best part is that it actually gets better (and spicier!) the longer it sits so you can make it ahead of time. 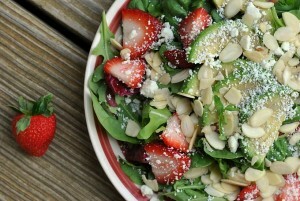 It is all whole foods and the flavor comes from the fresh ingredients and the grilled char. 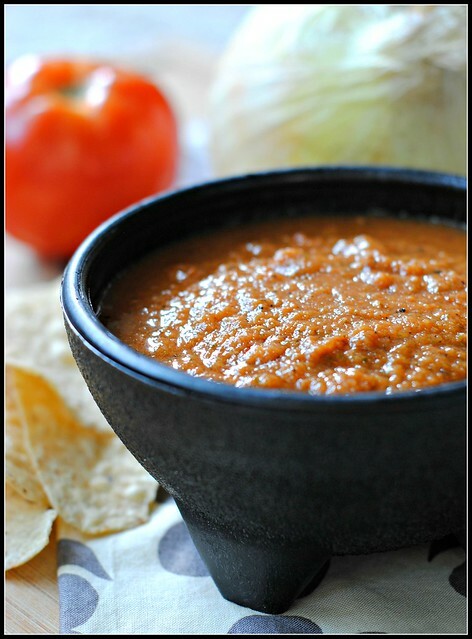 Now is the time of year to stock up on those tomatoes and makes some salsa. If you’re into canning…all the better! Enjoy! That’s amazing about your first goal (and 2 year dry spell lol) – Congrats! Bf goes through a jar of salsa a week so I’ll have to try this soon. That is my kind of salsa! I like it spicy and I like it blended more and less chunky. Do you put whole tomatoes on the grill, or cut them first? Can you explain your process for grilling the garlic, too? I don’t know how to get half a head of garlic to stay in tact. Hi Lizzie! Yep…whole tomatoes and the garlic I chop off the top (the part that comes to a point) and grill that whole, just using half the bulb in the recipe. Oh, duh! 🙂 Thank you! Thanks for the shout out Nicole! I saw my daughter yesterday for the first time in a few weeks – she asked “can you make me some salsa?” I brought her four jars! And I do like the fact that it gets a tiny bit spicier the longer it sits. Hooray for scoring a goal!!! The weekend went by fast for me too….I hate when that happens! 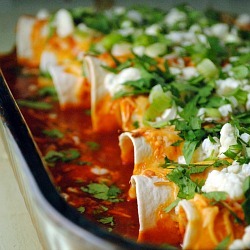 This salso looks yummy and easy……my kind of recipe! Congrats on your goal……..now that you’re in Michigan, did anyone throw an octopus on the ice for you? If I was there, I would’ve…….or, maybe not….lol! Biz also sent me this salsa along with the cherry one!! It reminds me of this restaurant called Chevy’s. We love their chips and salsa!! 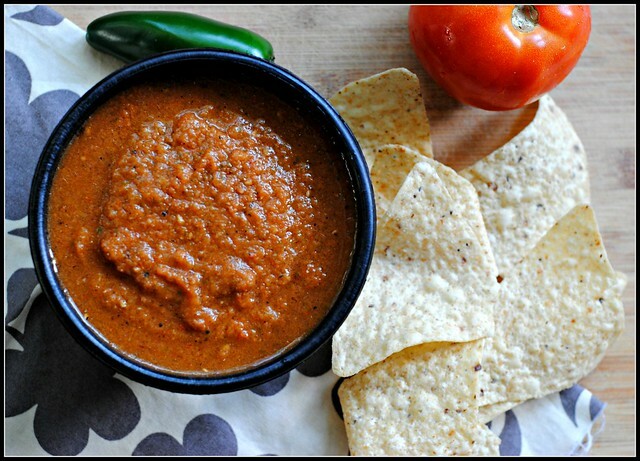 Fact: You cannot beat homemade salsa. It may be my favorite thing ever. Well, next to cheese. This looks like some of my favorite restaurant salsa! I have made that salsa a lot too! My sister makes it every time we have girls day out with our best friends. My recipe for gazpacho isn’t much different, although I don’t tend to roast the vegetables. I use green or red bell pepper instead of the jalapeno, scallions instead of onion and add cucumber too. Add a splash of red wine vinegar. And now that store-roasted Hatch peppers are available here in Texas, I threw in a couple of those and gazpacho has taken on a whole new meaning! Hi Rebecca! I would say between 25 and 30 minutes, but a lot will depend on the size of tomatoes, etc. You can’t go wrong with this one – enjoy!